More info on this video can be found at The Panel Jumper‘s hompage. I shot and edited another film for Trial and Error Productions. I hosted the premiere at Seattle’s The Triple Door, with opening band Happy Orchestra. 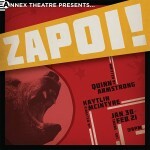 I set up a camera and recorded the final performance of Annex Theatre’s “Zapoi!” and subsequent strike and party. About seven hours condensed to 1 minute.